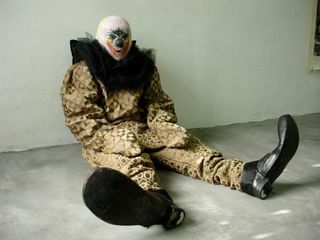 The show The Circus Crew is a research on relations and connections between contemporary art presentation and archaic performing models as circus, carnivals, parades and processions. The artists from various countries, Oana Farcas from Romania, Dionisis Christofilogiannis, Dimitrios Antonitsis, and Eva Mitala from Greece, Christian Jankowski from Germany, goldiechiari and Enzo Giordano from Italy, Laura Lima from Brazil, Anetta Mona Chisa & Lucia Tkáčová and András Cséfalvay from Slovakia, Delphine Reist from Switzerland, Peter Callesen and Gudrun Hasle from Denmark, will all reflect on these themes and strategies. They will react to subversive situations in contemporary society, stereotypical identities, exploring experimental investigation in the contemporary world of excess and visual overload in context of surviving mentioned atavistic forms of expression. All of these artists have already worked with the concept of theatricality, spectacularity and similar themes. Together, they will create an integrated playful and glamorous atmosphere which we remember from the childhood, from visiting circuses and also the feeling of awe from carnival parades and religious/pagan processions. Exhibitions of art, their performative nature were always close to carnivals, circuses, processions. The special atmosphere of rituals and some kind of trance, specific ways of behavior are similar. It seems that the more natural way of presenting art, as exhibitions, art fairs, biennials are in crisis and hardly can bring something new in the artistic discourse. Thanks to the biennals, the new kind of art works was born, more ephemeral, de-material, more conceptual, site specific, which are often outside the logic of art – market. An alternative step in this process could be changing in the art practice and try to apply some atavistic performing models. There is an interesting similarity between contemporary artists and acrobats, magicians, they can create some specific mystery, they are both working with human emotions, feelings, subconsciousness. Some of the artists will carry out performances during the opening.